The Angling Trust’s Building Bridges team has appointed Polish-born Janusz Kansik as Project Officer to help educate European anglers about fishing in this country. 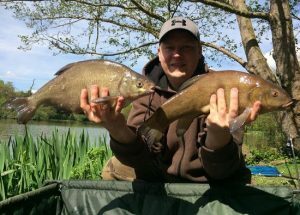 Since coming to England in 2010, Janusz has qualified as a Level 1 Angling Coach and joined the Voluntary Bailiff Service, supporting Environment Agency fisheries enforcement officers by regularly patrolling lakes and rivers near his home in Oxfordshire. Janusz said: “When I came to this country a lot of people invested their time in helping me make my fishing skills better, which I think was amazing. So I decided I wanted to help others as well and do this by making coaching videos and through my work as a volunteer bailiff. Funded by fishing licence income through partnership with the Environment Agency, the Building Bridges project engages with migrant communities, including schools, encouraging anglers to join a local club and fish by the rules. Building Bridges staff also work with angling clubs to host integrated angling events and contribute to Voluntary Bailiff Service training and Fisheries Enforcement Workshops.